“Mrs. Allen’s Closet; OR Fashion in the Time of Jane Austen” will look at the revolutionary changes in women’s dress during Jane Austen’s lifetime. What were these changes, what prompted them, and have there been similar fashion revolutions in modern times? MRS. ALLEN RESPECTFULLY REQUESTS ALL MEMBERS & GUESTS TO DRESS IN THEIR FINEST REGENCY CLOTHING! (or “THE LIKE” if possible). 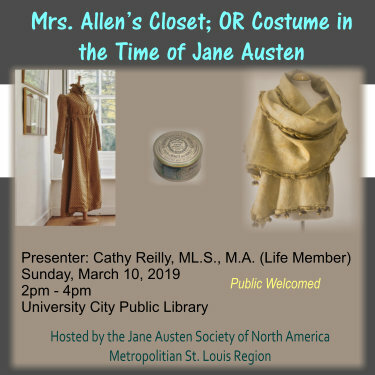 Cathy Reilly, ML.S., M.A., is a Life Member of JASNA and a founding member of our St. Louis chapter. She is a librarian and professor at the St. Louis Community College and for several years taught a Capstone course called “The Body Beautiful: Perspectives on Physical Attractiveness.” This class covered all aspects of human appearance and adornment including fashion and beauty practices from around the world. The JASNA - St. Louis Administrator is managed by the Web Manager and fellow JASNA-St. Louis Regional Officers. Any issues, suggestions, and requests can be sent to info@jasna-stl.org. Enjoy Gateway! 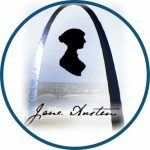 Jane Austen Society of North America – St. Louis | Powered by Mantra & WordPress.